Apple Worldwide Developers Conference (WWDC) 2012 happened back in June, but we’re now seeing the launch of the products, software and services mentioned and introduced, including last week’s OS X Mountain Lion. I sat down with our own Heath McKnight, doddleNEWS’ Web Content Manager, to discuss what was announced at WWDC. With hardware and the latest OS X now out, we also discuss iOS 6 and the iPhone 5. 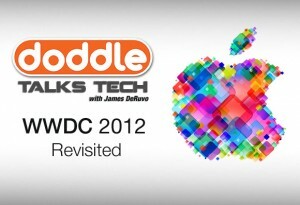 Listen to our WWDC 2012 podcast here. By James DeRuvo (doddleNEWS) Calling himself, “Just a dude who makes videos,” YouTube trailblazer Freddie Wong has transformed the art of streaming video into a mainstream entertainment format. You won’t want to miss this one.